You’ve got questions; we’ve got answers. Check out the list of frequently asked questions below and let us know if there’s anything we missed! Are the Carts at Sanibel Carts just like regular golf carts? 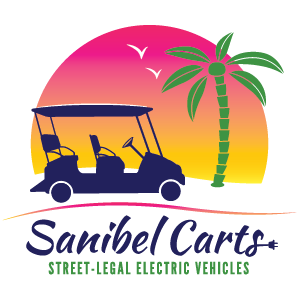 Sanibel Carts are street-legal, electric golf carts that are designated under Florida law as low speed vehicles (LSVs). These LSVs are permitted to drive on any street where the posted speed limit is 35 mph or less. All the roads on Sanibel and Captiva islands are 35 mph or less. Is there an age requirement to drive a Cart? Yes. You must be 21 years old to rent or drive a Cart. Is my 16-year-old allowed to drive the Cart if a 21-year-old registered driver is on the Cart, too? No. You have to be at least 21 years old to drive one of the Carts. How fast do the Carts go? The Carts go up to 25 mph. May I drive the Cart onto the beach or the Causeway? No. The Carts may only be driven on the roadways on Sanibel Island and Captiva Island. The Carts cannot leave the perimeter of Sanibel Island and Captiva Island. Can I drive the Cart on the bike path? No. It is illegal to drive any motorized vehicle, including a Cart, on the bike path. How far can the Carts go on a full charge? The Carts can travel approximately 35 miles on a full charge. Please return or charge your Cart when the Battery Gauge on the dashboard begins to blink. Where can I travel on Sanibel or Captiva within that 35-mile limit? Sanibel Island is 12 miles long and 5 miles wide. You can travel from Lighthouse Beach Park on the east end of the island all the way to the shops and restaurants on Captiva Island and back in just under 30 miles. All of our Carts are insured, but your current auto insurance will be listed as the primary insurer.